Jeff began folding origami at the age of 7. 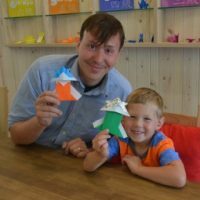 A childhood fascination with animals and a house full of scrap paper led to a great deal of excitement when he realized he could create his own animal figures simply by folding paper. 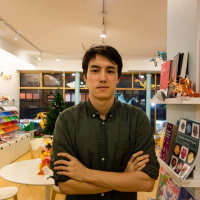 He bought a number of origami books and frequently folded while traveling on family trips and in his spare time, mostly focusing on representational models of animals as well as traditional and simple models. 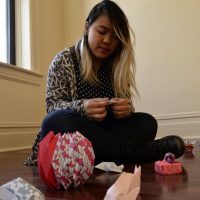 Jeff began working and teaching at Taro’s Origami Studio in 2014 and has loved being part of Taro’s staff and community of folders of all ages and levels. Aside from being an origami teacher and enthusiast, Jeff is a theater artist with extensive acting, musician, directing and teaching credentials. 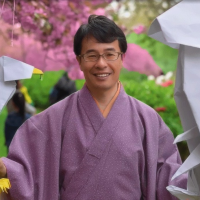 He enjoys crafting his origami models with the same eye for dynamic contour and character that he brings to his theatre work, and is passionate about empowering the inner artist through learning. 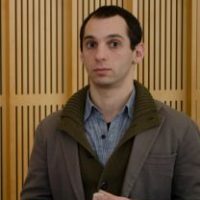 He is a graduate of New York University and the Dell’Arte International School of Physical Theatre. Jeff frequently travels for theatre work, so check his website for his exact whereabouts at a given moment.